Ruth Barber, 81, skydives in Moab with Valley View Hospital's Cancer Coffee Walk & Talk support group. The adventure was to celebrate her 81st birthday and survivorship milestones. Nancy Reinisch says her first cancer diagnosis was a surprise 12 years ago. She had always considered herself healthy, a non-drinker who had never smoked, an avid athlete who’s about to compete in her 100th triathlon July 29. Her answer was, “I put one foot in front of the other, because I have a husband and kids,” she said. Reinisch said that’s the tone she sets at a weekly cancer support group at Valley View Hospital. She spearheaded the “walk and talk” group in 2007 because she felt there wasn’t enough support for cancer survivors in the valley, she said. A psychotherapist by profession and a triathlete by hobby, she decided to form a support group that would walk and talk to address both the physical needs and the emotional needs of the local survivors who attend. “Many cancer survivors will experience depression and anxiety, and sometimes exercise is the best medication of all,” she said. “More often than not, we try to keep it positive. People are trying very hard to find something positive in their journey,” she added. A woman who attended the most recent meeting Thursday kept a smile on her face as she told the group she had had 35 radiations during her cancer treatment. Despite the news, she focused on the more positive and current aspects of her recovery. She’s been in remission for four years and explained cancer is less likely to reoccur after the fifth year. “I’m almost there,” she said to the group. Reinisch and registered nurse, Sara Houston, run the group, which generally comprises 15 to 20 people. The group convenes in the morning for a one-hour walk, rain or shine, and then meets in the chapel to discuss the healthiest ways to prepare a specific recipe, usually provided by Reinisch, and how that meal affects individuals living with cancer. Reinisch says one of the most important aspects of the group is the idea that even though each person has a unique journey and recovery, she tries to connect individuals with the same diagnosis because they can understand and support each other in ways the community or their physicians can’t. It’s not uncommon that group members offer input and opinions on various medications, procedures, symptoms, and side effects, during the “talk” segment of the meeting, she said. “A lot of things we’ve learned ourselves that doctors haven’t told us,” she said. “There’s a lot of things they give to each other that helps, that we don’t get out in the community,” she added. But even when members of the group discuss trials and tribulations, there’s still a ring of hope and positivity that runs throughout the room, she said. At Thursday’s meeting, a woman mentioned she doesn’t even think about her breast cancer experience anymore. She’s been in remission for six years. Another man said he only cried once during his colon cancer battle, when he had to tell his colleagues. And another woman with breast cancer cried Thursday about the anxiety she’s experiencing while waiting for test results, but focused on the consistent support she gets from her husband. “I think going to the group helped me become more positive because at first, I was by myself and it hit pretty hard,” said Ruth Barber, 81, in remission from colon cancer. She said she equates it to growing old and said, “You can sit around all day and gripe about it but it’s not going to do any good. If you’ve got to do something, you do it, like when I jumped out of a plane with Bridget,” she added. She referenced the group’s most recent adventure, which she and another group member, Bridget Steel, had planned. The group went skydiving over the Eastern Utah Desert on June 25 to celebrate survivorship milestones and Barber’s 81st birthday. 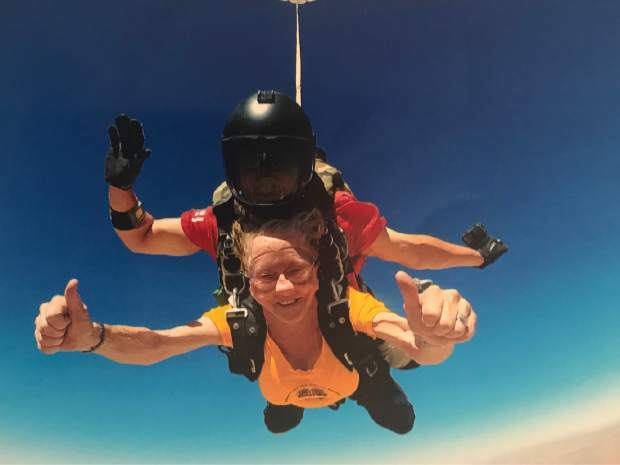 Andrea Thompson, a fellow jumper and ovarian cancer survivor, said she never would have considered skydiving, but after seeing Barber, 81, enthusiastic about the jump, she got on board. Steel, who helped plan the trip, said, “If we can all go through the things we’ve been through, we can do anything really. It felt good to get away from cancer and enjoy life,” she said. Members of the group express gratitude for the group, saying if it weren’t for the meetings, they may not have ever met each other. “We’re not a cancer group, we’re a family,” said Richard Pierce, a breast cancer survivor, and one of the handful of men in the group. Reinisch said she felt more like the group’s facilitator while she battled her first diagnosis in 2006. But, “Now I feel like tables have turned with my re-diagnosis, and they lead me,” she said. “Each person has a new tip, idea, [or] way to cope with the adversity, and it helps not only everybody else, but me now,” she said. “Cancer Coffee Walk and Talk” is the only support group that has an exercise component in Glenwood Springs, Reinisch said. It’s the fastest growing support group at Valley View Hospital, which provides the funding, she said. “Nobody should go through cancer alone and we want to find those people who are alone and need our support, because it’s a terrifying experience, and the more like minded, caring people you have around you, the more likely you are to finish your treatments and get into recovery,” she said. Reinisch said the service at Valley View Hospital helps those who don’t have loved ones to support them mentally or financially. 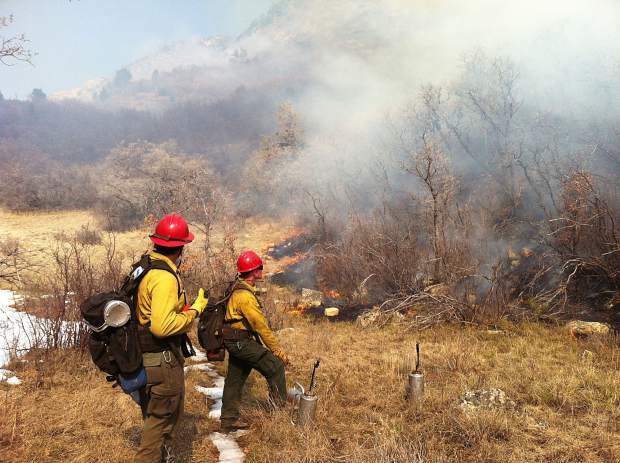 Anyone who faces an obstacle should have the support they need, Reinisch said. It’s not just unique to cancer survivors, she added.